This police chief was put on trial for possibly saying a bad word. The police now are happy that they have various cameras on themselves and their cars so they can’t be victimized by criminals and law breakers. Black citizens have discovered, resisting arrest brings no additional charges so they do this nearly nonstop now. On the other hand, black police have no fears of being fired instantly even when they commit crimes openly and are arrested. This double standard whereby a black person employed by the state or other areas, gets a ‘get out of being fired’ card while white males are punished severely for the slightest transgressions. From New York City comes this video of pro-Trump demonstrators who are shouting ‘USA’ in lower Manhattan. The leftists are on the other side of the street. Supporters of Trump to convene at Trump Tower, other place nationwide in marches to show pride in him | abc7ny.com but NOT the New York Times. All pro-Trump news is hidden from view because our Bilderberg/Mexico anti-Americans don’t want the US to know Trump has real support. Confrontations At Flag Burning Demonstration! Patriotic bikers attack Black Lives Matter flag burners in NYC – YouTube…this is happening in Germany, too, for example. We are witnessing a collapse of law and order which is IDENTICAL to the 1970s. Cities are being put to the torch. Police have to be very brutal to make simple arrests and innocent bystanders get killed by the police who are now on hair trigger reaction to mob and individual violence. Instead of fixing this, we have, IDENTICAL to the 1970s, everyone is taking sides including liberals opting for riots and endless crimes and conservatives wanting to turn back the clock to pre-civil rights. This is highly dangerous for everyone! 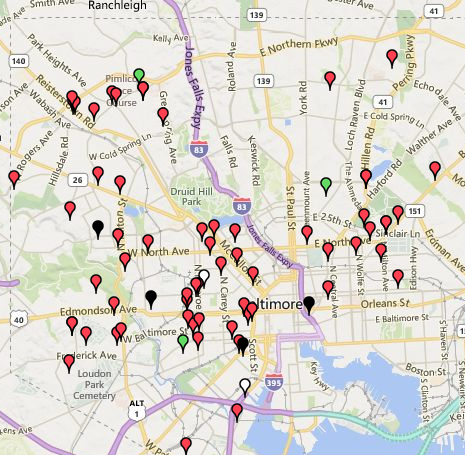 Baltimore Homicides the past three months. All but 5 murders are black victims with a dozen classified as ‘not known’. The black murder rate per person is tremendously higher than the white murder rate in America. Recent protests against police coupled with frightened mayors and governors punishing the police with increasing harshness has led to a surge in blacks murdering each other and anyone in their vicinity. This mess can’t be easily fixed for several reasons. One is the disconnect between suburban/rural gun crimes from inner city crimes in general. Most suburban/rural gun crimes are people killing family or neighbors over domestic disputes and divorces. Most of the victims of this are women and sometimes sadly, children. But the drive by shootings, the drug shootings and revenge shootings are city events for the most part.